A total of 65 jobs are to go at a Herefordshire-based cider company, it has been announced. HP Bulmer Ltd has begun consultation with staff over the job losses at its factory in Plough Lane, Hereford. A spokesman said it was "too early to say" whether it would include compulsory redundancies, but it was hoped some staff would be relocated. He said the move was part of plans which were aimed at securing the long-term future of the site. Bulmer Ltd, which has been based in the city since the 1930s, said employees had voted "overwhelmingly in favour" of the long-term plans for the site when they were balloted in September. "The benefits for the team at Bulmer include long-term commitment to site production and investment of around £7.5m, including a second can line to be installed by 2011," the firm said. A spokesman added that the jobs would be lost gradually and the firm would look at voluntary redundancies and helping people to relocate to other sites run by firm's owners, Scottish & Newcastle UK (S&N). 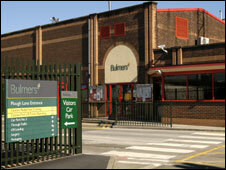 HP Bulmer Ltd in Hereford is not associated with Bulmers cider in The Republic of Ireland, which is owned by C&C and sold as Magners Irish Cider in the UK.